If you're on the hunt for a casual yet absolutely chic outfit, pair a Pinko turtleneck jumper with black leather leggings. Both items are totally comfy and will look fabulous paired together. Balance this outfit with black embellished leather slip-on sneakers. If you're after a casual yet totally stylish look, pair a Pinko turtleneck jumper with a navy tweed mini skirt. Both pieces are totally comfy and will look fabulous together. You could perhaps get a little creative when it comes to footwear and spruce up your getup with black leather pumps. 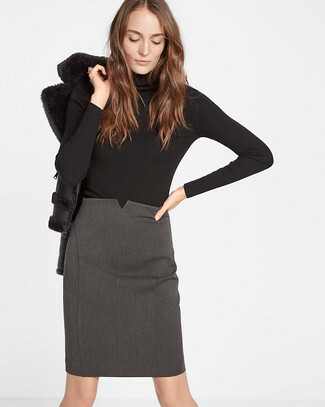 For a casually elegant ensemble, wear a Pinko turtleneck jumper from farfetch.com and a dark brown midi skirt — these two pieces play perfectly well together. 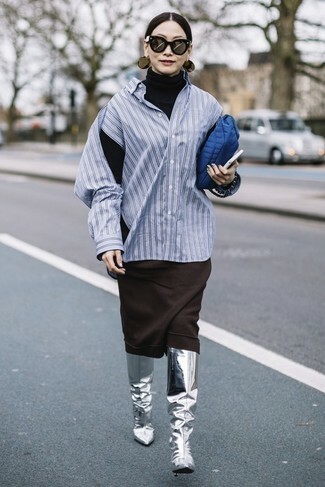 For something more on the daring side to round off this look, go for a pair of silver leather knee high boots. This combination of a Pinko turtleneck jumper and olive leggings combines comfort and practicality and allows you to keep it simple yet trendy. You could perhaps get a little creative when it comes to footwear and dress up your look with black fur knee high boots. 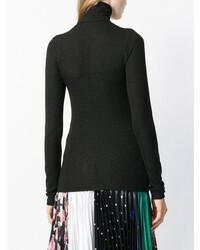 For a smart casual ensemble, wear a Pinko turtleneck jumper with a grey pencil skirt — these items fit nicely together. 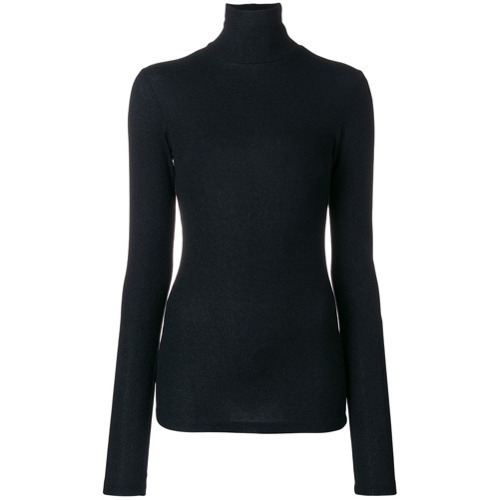 If you're in search of a casual yet stylish ensemble, wear a Pinko turtleneck jumper and black skinny jeans. Both pieces are totally comfy and will look fabulous together. Play down the casualness of your outfit with black leather mid-calf boots. 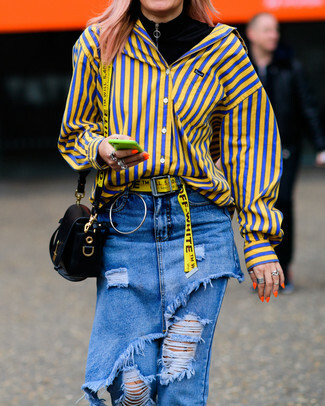 If you're searching for a casual yet totally chic getup, try pairing a Pinko turtleneck jumper from farfetch.com with blue ripped jeans. Both items are totally comfy and will look fabulous paired together. Up the cool of your look by wearing brown leopard leather pumps. If you're searching for a casual yet totally stylish ensemble, choose a Pinko turtleneck jumper and blue ripped jeans. Both items are totally comfy and will look fabulous paired together. For a cool-meets-chic outfit, try teaming a Pinko turtleneck jumper with black leather skinny pants — these pieces go perfectly well together. Round off with black embellished leather heeled sandals and off you go looking wonderful.